Objetivo: simular conexiones exteriores inalámbricas punto a punto o punto a multipunto con ap lightweight en vez de los standalones. Access points within a mesh network operate as either a root access point (RAP) or a mesh access point (MAP). -RAPs have wired connections to their controller, and MAPs have wireless connections to their controller. -MAPs communicate among themselves and back to the RAP using wireless connections over the 802.11a radio backhaul. 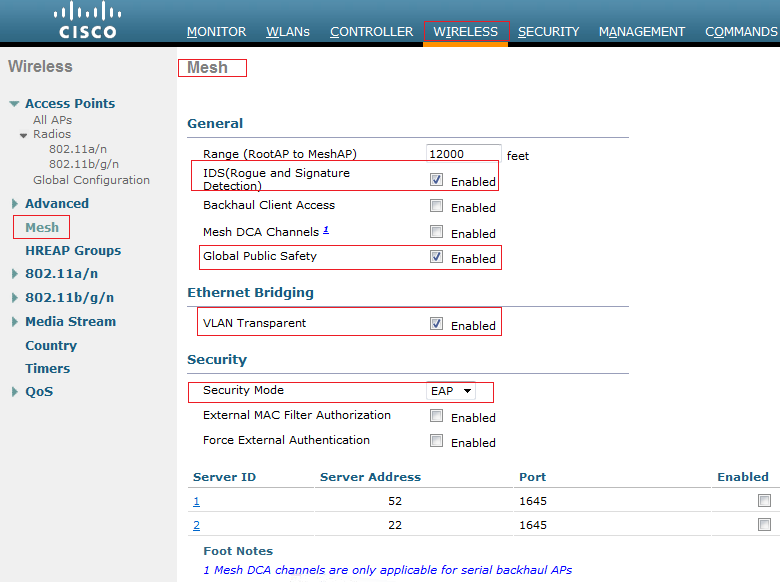 -MAPs use the Cisco Adaptive Wireless Path Protocol (AWPP) to determine the best path through the other mesh access points to the controller. Wireless mesh networks can simultaneously carry two different traffic types: wireless LAN client traffic and MAP Ethernet port traffic. Wireless LAN client traffic terminates on the controller, and the Ethernet traffic terminates on the Ethernet ports of the mesh access points. Relationships among access points with the mesh network are labelled as parent, child or neighbor. •A parent access point offers the best route back to the RAP based on its ease values. A parent can be either the RAP itself or another MAP. –Ease is calculated using the SNR and link hop value of each neighbor. Given multiple choices, generally an access point with a higher ease value is selected. •A child access point selects the parent access point as its best route back to the RAP. •A neighbor access point is within the radio frequency (RF) range of another access point but is not selected as its parent or a child because its ease values are lower than that of the parent. –24 Mbps is chosen as the optimal backhaul rate because it aligns with the maximum coverage of the WLAN portion of the client WLAN of the MAP; that is, the distance between MAPs using 24 Mbps backhaul should allow for seamless WLAN client coverage between the MAPs. –A lower bit rate might allow a greater distance between mesh access points, but there are likely to be gaps in the WLAN client coverage, and the capacity of the backhaul network is reduced. –An increased bit rate for the backhaul network either requires more mesh access points or results in a reduced SNR between mesh access points, limiting mesh reliability and interconnection. –The wireless mesh backhaul bit rate is set on the controller. Note The backhaul bit rate is set on the Wireless > 802.11an > Network page within the 802.11an global parameters section. •The required minimum LinkSNR is driven by the data rate and the following formula: Minimum SNR + fade margin. The next table summarizes the calculation by data rate. –We do not recommend using data rates greater than 24 Mbps in municipal mesh deployments as the SNR requirements do not make the distances practical. M: Previo, conectamos los dos LAPs al switch de acceso, mediante la Vlan por la cuál se conectarán al WLC con modo LOCAL. Cambiamos el nombre de los LAP y le asignamos direcciones ip estáticas. 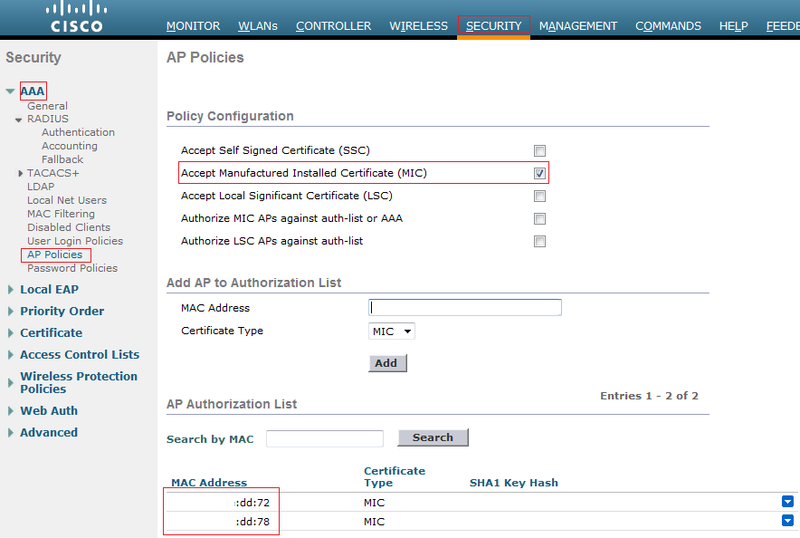 • An AP in mesh mode needs to be authorized to join a controller. So the first step is therefore to add there mac address. 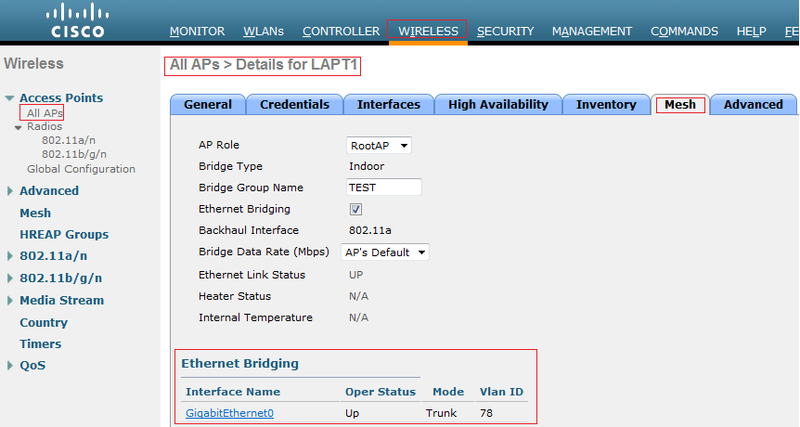 Once the AP reboots, a new MESH tab is available under: Wireless > All APs, click on LAPT1 or LAPT2. 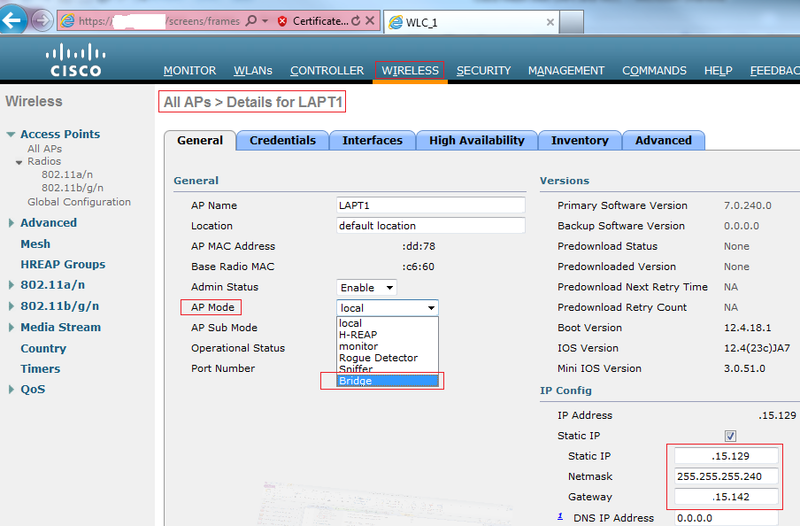 To prevent LAPT2 from simply connecting back up to the WLC through its wired port, Either place AP2 into a VLAN not routable or make the wired port shut for LAPT2, so that it has no path to the WLC except though its radios. Now my Both AP are up. ○ Normally this parameter applies to outdoor mesh access points to report Rouges to Controller. ○ It applies to APs with 2 or more radios. ○ When it’s disabled, 11a radio -> backhaul, 802.11b/g -> Client associations. ○ When Extended Backhaul client access is enabled, even slot 2 can be used for client associations. ○ When we change the channel under RRM then MAP will not detect this and they will continuously use that channel, so if we enable this feature the MAP will detect the channel change on RRM. ○ The VLAN tagging only works on non-backhaul Ethernet ports. 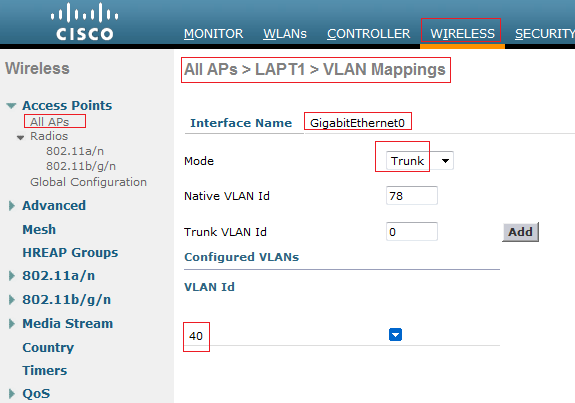 ○ When this feature is disabled, all packets are tagged as non-VLAN transparent or VLAN-opaque . This implements VLAN tagging. § PSK or Local EAP authentication is performed within the controller if External MAC Filter authorization parameter is disabled. § If the MAC address is not found in the local MAC filter list, then the RADIUS server is checked. § Protects against rogue APs. § When this is enabled along with External MAC filter authorization the RADIUS server decisions override the local MAC filter list. By default Ethernet bridging is not allowed, it’s dropped on RAP Ethernet port, untagged. To allow VLAN tagging we must disable VLAN Transparent option (Wireless > Mesh). Once we disable it VLAN tag will be accepted. Para cumplir con el escenario queremos que al conectar una PC al puerto Gi0 del MAP, este obtenga una ip addres en la vlan40. •Ethernet ports on access points function as either access or trunk ports within an Ethernet tagging deployment. •Access Mode- In this mode only untagged packets are accepted. All packets are tagged with a user- configured VLAN called access-VLAN. For this mode to take effect, the global VLAN mode should be non-VLAN transparent. –This option is used for applications in which information is collected from devices connected to the MAP such as cameras or PCs and then forwarded to the RAP. The RAP then applies tags and forwards traffic to a switch on the wired network. •Trunk mode—This mode requires the user to configure a native VLAN and an allowed VLAN list (no defaults). In this mode, both tagged and untagged packets are accepted. Untagged packets are always accepted and are tagged with the user specified native VLAN. Tagged packets are accepted if they are tagged with a VLAN in the allowed VLAN list. For this mode to take effect, the global VLAN mode should be non-VLAN transparent. –This option is used for bridging applications such as forwarding traffic between two MAPs resident on separate buildings within a campus. –The trunk port on the switch and the RAP trunk port must match. •A configured VLAN on a MAP Ethernet port cannot function as a Management VLAN. •The RAP must always connect to the native VLAN (ID 1) on a switch. –The RAP’s primary Ethernet interface is by default the native VLAN of 1. Note You cannot bridge VLAN ID 1 when using VLAN-Opaque Ethernet bridging because VLAN 1 is the internal native VLAN within a mesh network. This setting cannot be changed. Una vez que conecto la PC tengo conexión en la vlan40.